Precious metals futures finished divided Thursday with platinum and palladium higher and gold and silver lower. Palladium posted its fifth consecutive record settlement. Gold for February delivery declined $4.60, or nearly 0.4%, to settle at $1,287.40 an ounce on the Comex division of the New York Mercantile Exchange. The yellow metal slipped as the U.S. dollar climbed. "Gold has seen some consolidation beneath the psychological $1,300 level, with a pull on each side of the market," Reuters quoted David Meger, director of metals trading at High Ridge Futures. "There is some support from the Fed less likely to raise interest rates and yet on the other side a little lesser need for safe haven as we’ve seen a rebound in equities as of late." 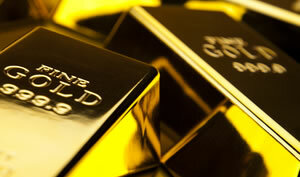 Gold futures ranged from a low of $1,287.10 to a high of $1,298. They gained 0.5% on Wednesday, declined 0.3% on Tuesday, and rose 0.3% on Monday. Last Thursday, they finished at $1,294.80 an ounce for their best settlement since June. 14. Ending lower for the fourth time in five sessions, silver for March delivery shed 9.2 cents, or nearly 0.6%, to end at $15.643 an ounce. Silver futures traded between $15.62 and $15.83. They moved up 0.1% on Wednesday, lost 0.3% on Tuesday, and dipped 0.2% on Monday. Last Thursday, silver registered its best settlement — at $15.797 an ounce — since July 16. April platinum edged up 80 cents, or 0.1%, to $826.10 an ounce, ranging from $823 to $833.20. Palladium for March delivery tacked on $3.80, or 0.3%, to $1,273.20 an ounce — another record close. Palladium prices traded between $1,260.80 and $1,279.80. Gold rose $3.30, or 0.3%, to $1,291.90 an ounce. Silver added 8.5 cents, or 0.5%, to $15.705 an ounce. United States Mint bullion sales were unchanged following three straight days of gains with the release of 2019-dated coins on Monday.